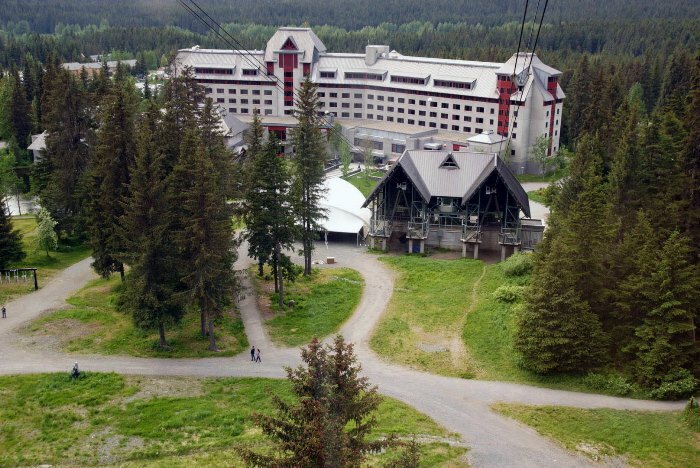 There are several good reasons to pay a visit to the Alyeska Resort, even if you’re not spending the night. 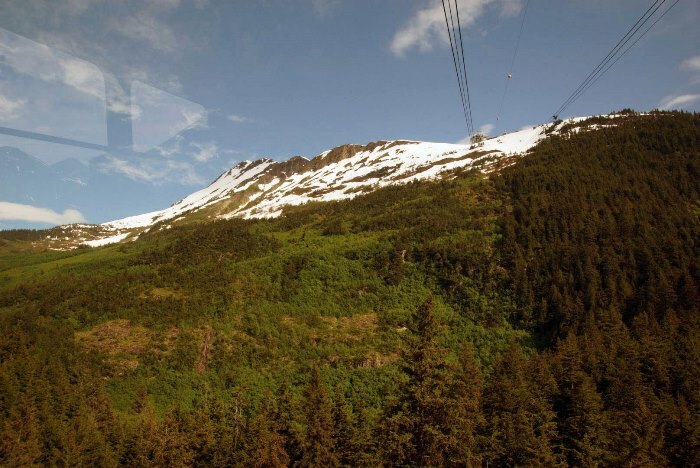 One of which is the Alyeska Scenic Tram, which climbs the hill directly behind the resort — giving you a breathtaking view of Turnagain Arm and the Kenai Peninsula. 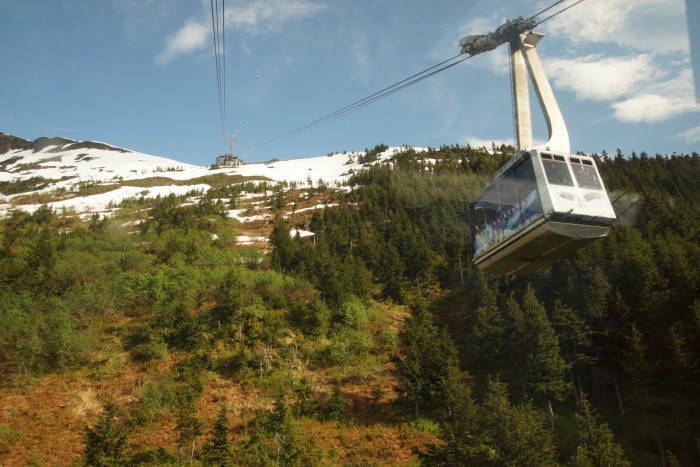 The Alyeska Resort is located south of Anchorage in Girdwood, Alaska. From Anchorage, take the Seward Highway (Alaska 1) south to the Alyeska Highway, and turn left. Follow the Alyeska Highway to the end, and park in visitor parking. I love to climb a mountain, but if there’s a way to get to the top of one without all the effort, I’m more than happy to take the easy way out. 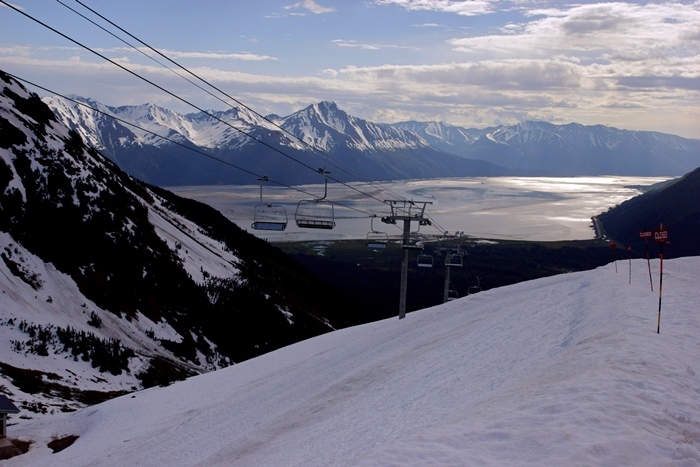 Such is the case at the Alyeska Resort, where a tram can whisk you up to a nice viewpoint in a matter of minutes. 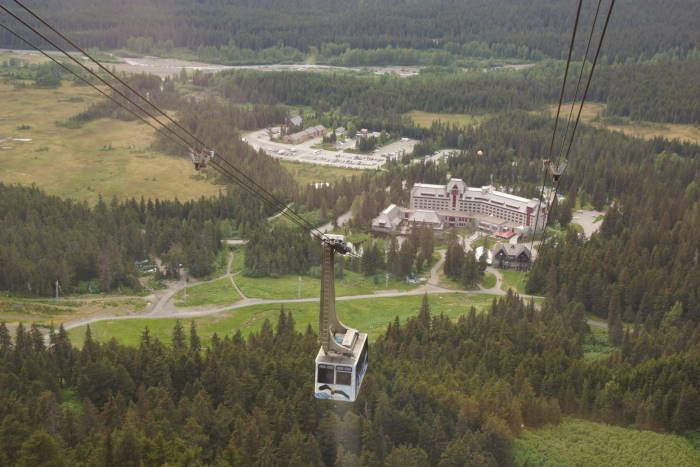 The tram station is at the far end of the Alyeska Hotel. If you parked in the visitor lot, you’ll need to walk by the front of the hotel and continue around to the far side, where you’ll find the station. Or, you can walk through the hotel, go up one floor, and you’ll pass the ticket station near the exit. On the day of my visit, the trams were running every 15 minutes or so. It was no problem getting a walk-up ticket, no reservations required, even on the busy Memorial Day weekend. At the halfway point, you’ll pass the other tram car on its way down. During the summer months, the ride takes 7 minutes. It’s twice as fast in the winter, to rush skiers to the slopes. You gain about 2,000 feet along the way. 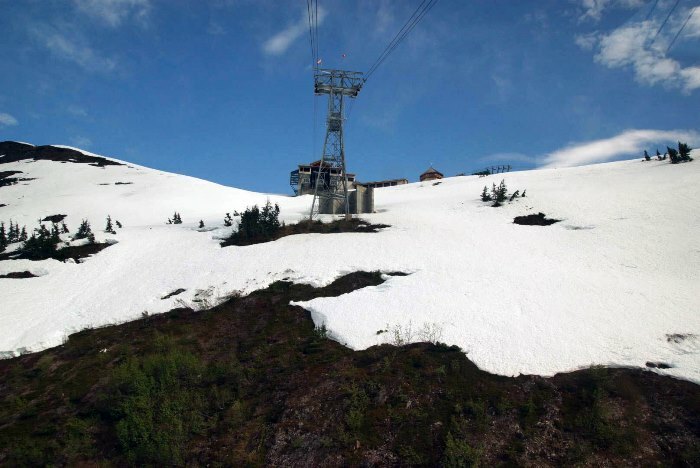 Since I was visiting the mountain relatively early in the summer season (technically, still late-spring), there was quite a bit of snow remaining near the tram station. This meant I had the chance to frolic around in the snow — or more accurately, watch other people frolic. The snow is well- trampled at the tram station exit. So what can you do at the top? Enjoying the view tops the list. 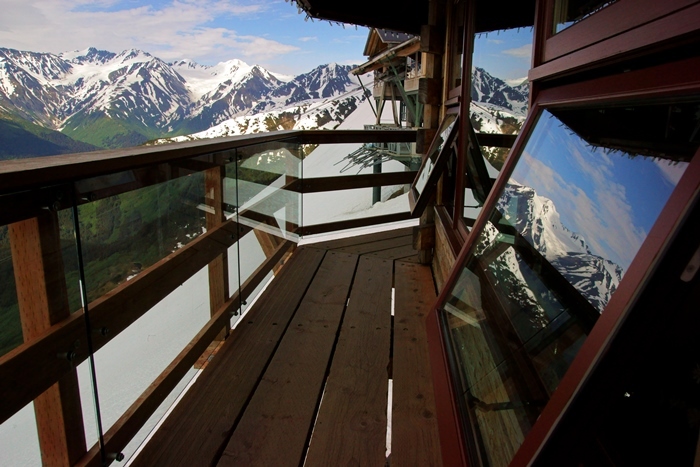 Up here, you have an outstanding view towards Turnagain Arm, and beyond it, the Kenai Peninsula. The resort also promises a view of seven hanging glaciers, somewhere out there in between the jumble of mountain peaks. Here’s a panorama shot of the view. You’ll see one of the ski lifts in the foreground. They are not running during the summer months. I had hoped to do some hiking at the top, but because of all the snow (and numerous “closed” signs around the perimeter), I wasn’t able to get very far. The deli and any other businesses in the tram station’s building were closed at this time of day (late afternoon), but the gift shop/museum inside the “Roundhouse” was open. 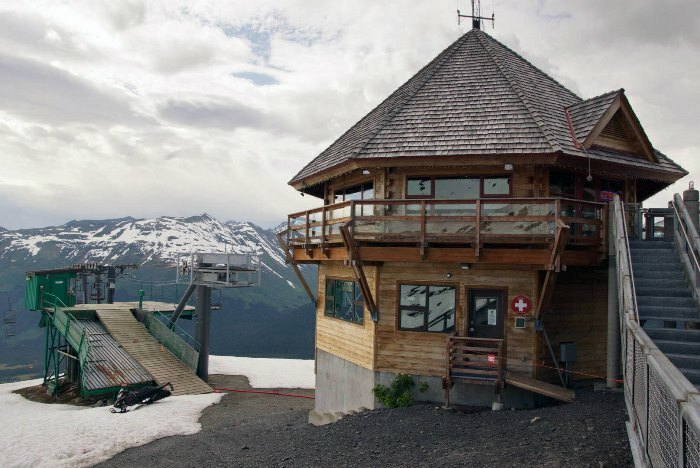 The Roundhouse served as the upper terminal for Alyeska’s first ski lift. 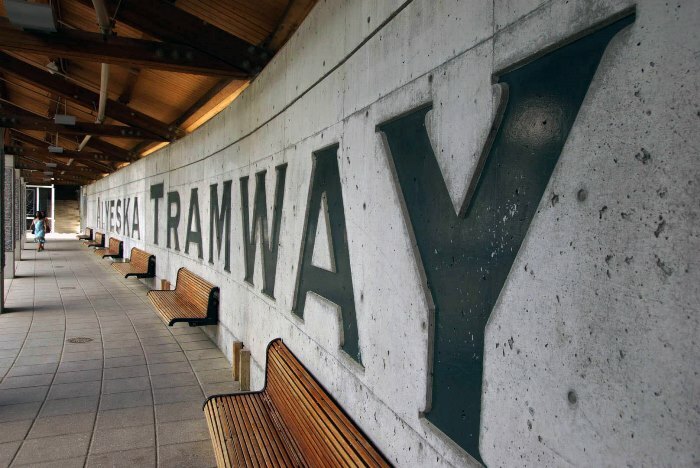 It was built in 1960 and renovated in 2003, about a decade after the modern-day tram took the place of the original lift. Inside, you’ll find some historical exhibits and examples of half-century-old ski equipment. 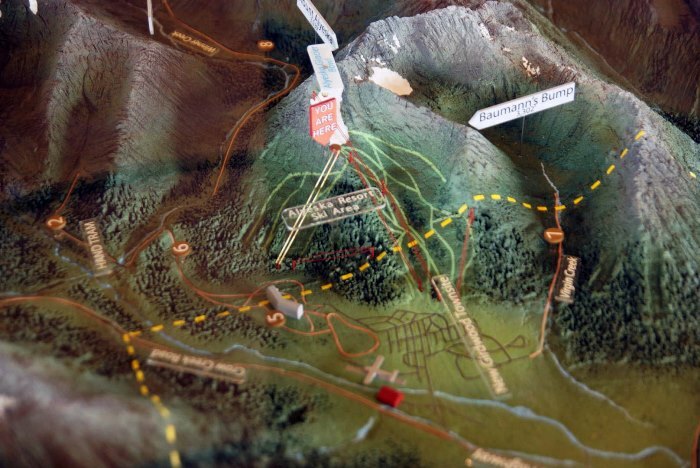 You’ll also find this model of the mountains, that includes the ski resort. Even if you’re not fortunate enough to go inside the Roundhouse, you can still walk around the wrap-around porch, and enjoy the view. After about a half-hour at the top, I decided it was time to head back down. Even though I had added an extra layer of clothing, it was chilly up there. … and provides a nice view of the hotel. In the lower-right corner of the picture, you can see the start of the Winner Creek Trail. You may also spot some wildlife as you go up and down the mountain. Black bears are fairly common, while brown bears are much more rare. A tram ride is $25 per adult (as of 2016). You can combine a ride and receive a $20 voucher for a deli-style lunch at the top for $35. 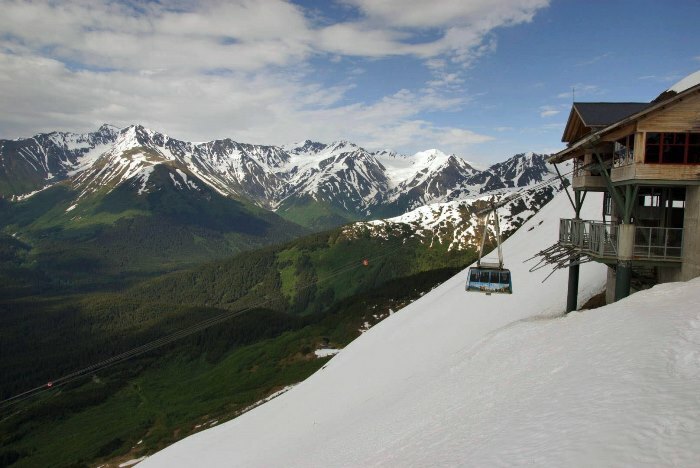 If you’re eating at the swanky Seven Glaciers restaurant at the top, the ride is free. 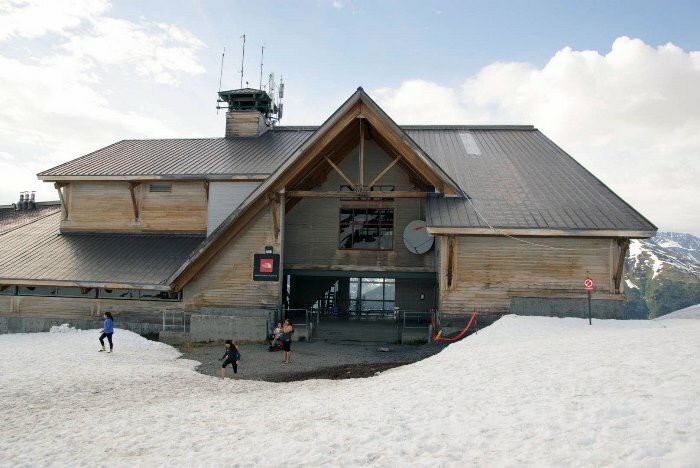 If there’s still a lot of snow at the upper station, there isn’t a whole lot to do up there. You can hike around on the snow a little, visit the Roundhouse, and enjoy the view, but you’ll probably be done in about 30 minutes. Does that mean the trip is worth $25? I’m not sure. But there’s no question — the view is beautiful.